Our hotel barges are more than just vessels for getting from Point A to Point B. Each one has a unique history and personality – something you’ll recognise from the moment you step aboard. If you’re travelling with us in Gascony or in the Bordeaux wine-growing region of Southwest France, you’ll have the opportunity to spend time aboard a floating masterpiece – the Rosa. The Rosa began life as an old “clipper barge” in Dedemsvaart, Holland, in 1907. The barge served commercial purposes until 1990, when she was converted into a charming floating hotel that cruises sedately along the waterways of south-west France. 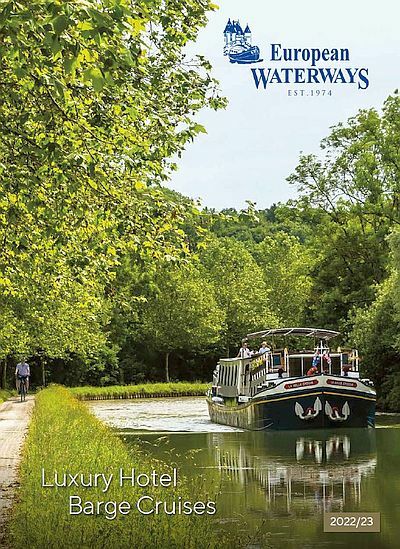 Twenty years later, in 2010, the Rosa got another face lift – this time for cruising the Canal Latéral à la Garonne, a stunning section of the larger Canal des Deux Mers. The latest upgrades to the Rosa include a completely air-conditioned interior, four ensuite staterooms (accommodating up to eight guests), a bar, and a beautiful wood-panelled saloon which offers a welcoming ambience. As a guest aboard the Rosa, you’ll stay in one of four staterooms named after historical persons of note from the Gascony and Bordeaux area. For example, you might stay in the Henri de Toulouse-Lautrec room, named after the diminutive Post-Impressionist painter best known for his depictions of the Moulin Rouge. Or you may sleep in the room named after Jean-Dominique Ingres, known for his Neo-Classical works including portraits of famous subjects such as Napoleon. From April to October, the Rosa meanders gracefully along the Canal de Garonne through Gascony and Bordeaux on her Classic cruise. As you pass by medieval towns, orchards and vinetyards, you’ll be travelling in the footsteps of English celebrity chef Rick Stein. A decade ago, BBC’s 10-part television series, Rick Stein’s French Odyssey caused a splash with its depictions of the chef’s six-week voyage of culinary discovery from Bordeaux to Marseille aboard the Rosa. When you embark on your own French odyssey with us, you’ll understand what makes this historic barge so special.